Is it bad that I want to breed my Budgies for one that is personally hand tamed by me? Of course I wouldn't force them to breed asap or anything like that but I want to have one budgie that is hand tamed. I got my two Budgies from a pet store and I know now that it will be harder to tame them if at all. I wish I looked for a breeder first but I love my budgies even if they never really bond with me on a close personal level. To answer your rhetorical question... Yes it IS a BAD idea . I’ll explain.. First, Talk Budgies mission is to guide pet owners toward the “Best Practices” for keeping your budgies happy and healthy. An experienced and ethical breeder will not just become a breeder for the reason you mentioned. 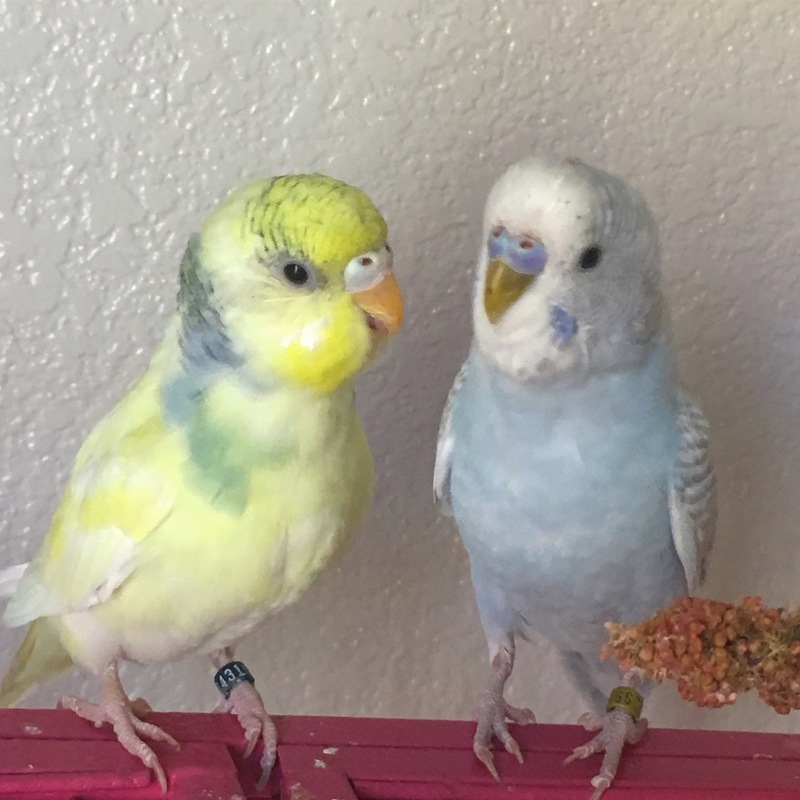 Those in this group who do breed first have a deep understanding of the budgie species, all aspects of their care and behavior, diet, set up, etc. Also knowing the risks of breeding and what to do in an emergency. Not to mention they’re too young anyway. Furthermore, commercially “bred” budgies found at big box stores have random genetics, and many have health problems that show up. It’s hit or miss if you get a ‘good’ one or not. It’s best to avoid procreating with commercially bred budgies. When you introduced yourself several days ago, included in the material you were asked to read, we’re these links. It seems you haven’t yet read them? Now to address your reason for wanting to breed your budgies, please understand that there is never a guarantee that you will have hand tame budgies. Generally speaking, when budgies mature, they tend to become more independent. Even the hand raised ones. The budgies that you see on videos and pics that are cuddly and love to be handled, are the exception... You can do all that is humanly possible and do it right, and still not end up with a budgie that wants to (or even will tolerate) close interaction with a human. Whether or not a budgie becomes a handleable one or not, depends on that individual’s personality. That is something we can’t control. Breeding budgies is far more involved and complicated than meets the eye. Your best bet is to stick around and learn all you can about the species, and most of all, to have patience. You were told what to do to try to tame your budgies. It has not been nearly long enough to have seen any results. With wild budgies, it can take many weeks OR even many months to see any measurable difference. This is truly an exercise in patience. Patience with slow change is a good life skill for all of us to learn. Again, please read the links above, as well as all the Stickies on the forum. If you have questions about giving your two beautiful budgies the best care, we’re here for you. Last edited by RavensGryf; 12-20-2018 at 01:34 PM. To answer your rhetorical question... Yes it IS a BAD idea <img src="https://www.talkbudgies.com/images/smilies/frown.gif" border="0" alt="" title="Frown" class="inlineimg" />. I 100% agree with RavensGryf, it is a bad idea. If you want a hand tame bird please look for a breeder that has raised and tamed her babies and purchase from them. Still no guarantees about how tame the bird will be but you will avoid many pitfalls that can come along with breeding. Don't give up on your current budgies, it takes a long time to train so there is till a possibility that you will be able to accomplish that. Although we have birds living in our homes they are really not domesticated as a cat or dog is and still retain much of their wild characteristics so if the bird does decide to accept you as a friend and flock member you should consider it a real privilege. You should never breed your budgies because "you want a hand tamed budgie". You have been given excellent advice by RavensGryf and Cody. I sincerely hope you will be a responsible owner and put the well-being of your budgies' first and foremost always. Most budgies do not want to be "petted and kissed" even when they are tame and bonded to the owner. It is important you have realistic expectations when it comes to owning birds. Please take the time to read the stickies and budgie articles which will help you understand our little feathered friends much better. As mentioned above, you should NOT ever even think that breeding your budgies (with no breeding experience) will somehow produce budgies that are hand-tamed. You've been given great advice above and I agree completely. Not only is breeding budgies without any experience incredibly dangerous for the budgies' health and well being, but it is never guaranteed that the babies will ever be "people birds", as mentioned above. Budgies are not "touchy" birds and are not huge fans of being petted. With time, it is possible to gain a very close bond with your pet store budgies (my girl is seven, and she's from a pet store, and after years of care we have a very strong bond) but it will take a lot of patience and hard work.